Let Beth Be Your Attendees' Nerdy Best Friend! Beth Ziesenis… Author. Speaker. Nerd. 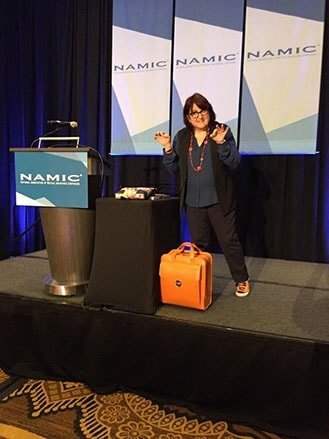 Your Nerdy Best Friend is not a traditional “Sage on the Stage.” Beth engages attendees before her programs with funny, nerdy pictures, social media updates and serious buzz creation. During the program, attendees will love giveaways like the nerdy rubber ducks, knee-high nerd socks and much more. You’ll also see games and group exercises to facilitate networking and collaboration, leading to shared laughs and new connections. The author of four books, Beth keeps up with the latest technology to educate and entertain attendees with the fast-changing world of technology. Beth speaks to groups of every size, from 10 people to 1000. 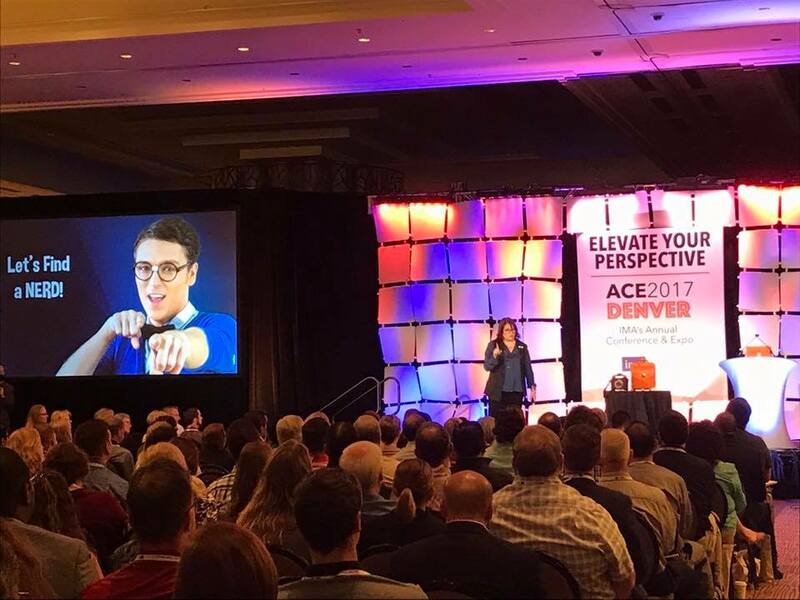 Speaking to associations and corporations throughout North America, Beth entertains, enlightens and empowers attendees to embrace their inner nerds to become more efficient, more productive and definitely more nerdy. 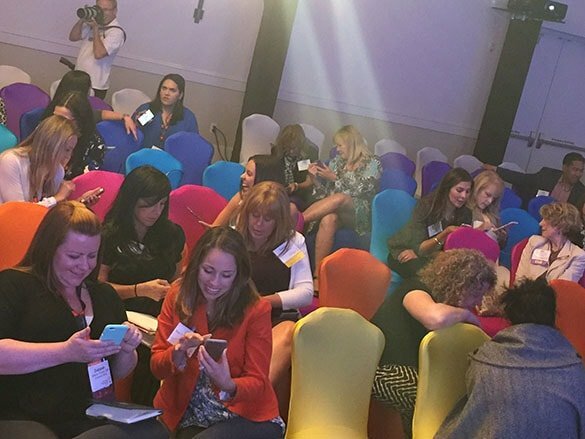 All Beth Z’s sessions include interaction, laughs and learning — even when she presents from afar! Attendees walk out of the session with tools they can use right away. Beth’s presentations marry the funny with the functional with a lot of audience participation built in! Watch this short video to understand more about Beth Z’s programs and offerings. This laugh-filled keynote helps your attendees visualize a tech-filled day from sunrise to sunset. Our most popular breakout! This session shares the nuts and bolts of tech tools to help your attendees live and work more efficiently. Are your attendees struggling to create content for their pages and newsletters? This session has dozens of tips for better images and multimedia. Artificial intelligence offers attendees the opportunity to grow their staff… without growing their payroll. Interactive, interactive, interactive! This guided session gives attendees a chance to share their favorite tech tools with each other and get new ideas together. Real Estate professionals love the practical information they can use right away, and housing managers use the tools to create community. Co-Op Organizations need to engage their customers and organize their worlds. Beth Z personalizes programs just for them. As banking and financial professionals modernize their technology, they need to understand the apps and tech tools that the rest of the world is using. Housing managers need new tools to create community and manage their time. Medical group managers and practice staff use the tech tools to organize their offices and make connections with patients. Other healthcare professionals can learn great ways to make their lives easier. Medical Group Managers Associations including Louisiana, Illinois, Idaho, Tennessee, Georgia and more. As a former association professional herself, Beth Z understands the unique needs of member-based organizations. Regional and State Association Executive Organizations including California, Texas, New York, New England, Colorado and many more. Regional and State MPI Organizations including Tennessee, New Jersey, Ottawa and many more. From superintendents to school nutritionists, Beth Z personalizes programs for educational organizations. Beth Z speaks shares tools for small/medium business professionals in communities as well as tools for the chamber executives who work for them! Some manufacturing and distribution professionals need help keeping up with tech tools that can help them with sales, marketing and office operations. Beth's programs can be personalized for any group where professionals carry a smartphone. Really. Here are few more clients. Let Beth Z create a custom program for your attendees. With a travel-inclusive day rate, you can choose more than one session for the same fee. Bonus: Ask about Beth in a Box!